I was doing a termite inspection a few days ago and was asked by one of the neighbours why are you bothering to do a termite inspection. Before I go any further I’ll just explain the situation of the job to give a better understanding. So I was called out to do an inspection for a lady that is selling her townhouse. The small complex has a total of 28 units and each set of two units are joined by a dividing wall. Now the unusual thing with these units is that there is no timber in them or at least none in the walls. The only timber in the units is in the roof void so you would think they would be safe from termite’s right. Now going back to the neighbour asking why to bother doing an inspection, he was thinking the same thing. Because the units have no timber in the walls why do you need a termite inspection? The walls were made out of Polly core filled blocks and the roof frame made of timber, all of the windows and door frames are made of steel. So this should be a pretty safe bet not to ever have a termite issue. Well not in this case, during the inspection we found live termites in the roof void. 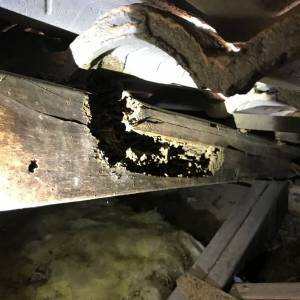 The termite in question was schedorhinotermes a very destructive termite and had caused extensive damage to the roof void timbers. They had gained access to the unit from the unit next door so that the owner then had to be notified. The following day we came back to inspect the other unit and found even more damage there. So they started out in the first unit and then moved over to the other one. The unit where they first gained entry has the worst amount of damage as you can see in the pictures and video. The termites had made their way up through the Polly filled wall blocks into the roof void and had gone undetected for some time. Some of the trusses and the tile battens were at the point of collapse. A builder has been called in to do some very expensive repairs to the roof void. The owners of both units were stunned that they had termites, again because there is no wood in the bottom part of the buildings. This is why all buildings should have an annual termite inspection Brisbane carried out. You just don’t know what is going on behind those walls. Even if you have a home built with a steel frame it is still important to have an inspection done. The termites will happily eat the skirting boards, door and window frames. There aren’t many homes these days built with all steel window and door frames. Once the inspection was completed the customers of both units gave us permission to carry out a colony treatment. The colony treatment is exactly what it says; we destroy the colony of termites within the building. The way we do this is by injecting a product into the termite workings. Once the product has been put into as many of the working as possible it is left for about 10 days to work. 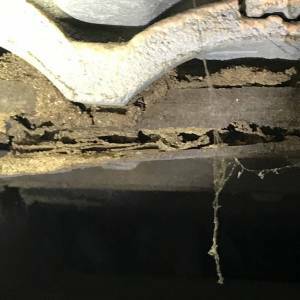 A second inspection of the damaged areas and the termite workings is then carried out to determine if there are any live termites still. If there is any further activity a second treatment will have to be applied. In this case, the first treatment did the job and there was no further termite activity. We now start with the barrier treatment. So once the colony control treatment has been completed and we are satisfied there are no more termites. We start the termite barrier treatment this involves digging a trench all the way around the two units. The barrier would be pointless if one of the owners said no because we need to have a complete chemical barrier. The only way to achieve this is by installing a barrier around both units at the same time. So if you live in a townhouse that is joined via a dividing wall you need to talk to your neighbour about a good termite management plan. So where there is soil we dig a trench down to the footings and the trench is 150mm wide. What we had to do was remove all the soil and replace it with a new sandy-loam. The reason for this is the soil we removed was full of debris like pieces of wood and rocks. Where the soil is not good it must be replaced with a good quality sand-loam soil this will allow the termiticide to stick to the soil properly. Where there are areas of concrete we drill through to the soil underneath and inject this area with the termiticide. By doing the trenching and drilling through the concrete it will form a complete protected zone around the units. Any termites that come in contact with the soil will pass the chemical to other termites eventually wiping out the colony. The termiticide we use is Termidor HE; this is a high-efficiency Termiticide that will penetrate further into the soil. The further into the soil we can get the product the better the protected zone is around the building. 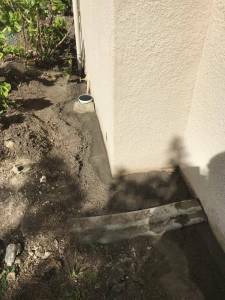 There are different products to use for a termite barrier Brisbane treatment, but Termidor and especially Termidor HE is the best on the market for this type of treatment. Too often many other termite companies will use an inferior product because it’s cheaper but this is not the best option for the client. Termidor gives a life expectancy of 8 years whereas other products only give 1 to 5 years. If you are having a chemical termite barrier Brisbane installed around your home ask what product is being used. Well, this should be good enough reason to now understand why it is important to have an annual termite inspection Brisbane. When choosing a termite company ask if they have thermal imaging cameras to check for termites in the walls. Thermal imaging cameras are a great way of detecting termites in hard to reach places. Also, make sure where possible that the termite inspector goes into the roof void area. I here only too often that termite technicians aren’t going into roof voids to check for termites, this is wrong. It is part of the standard that a roof void must be checked it reasonable access is possible. Don’t take the chance on termites it pays to have a quality termite inspection Brisbane done every 12-months.